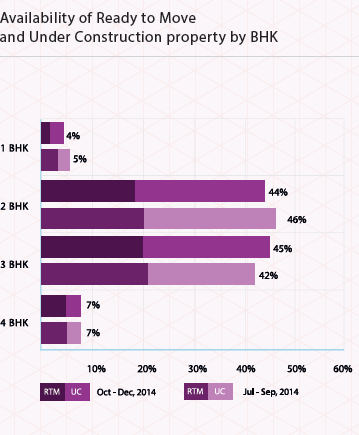 Infrastructural bottlenecks continued to plague Kolkata real estate, translating into a dip of two per cent in Oct-Dec 2014 as compared to the Jul-Sep quarter. While capital values in North Kolkata remained stagnant, prices in the eastern and southern zones declined by one percent and two per cent, respectively. Central Kolkata witnessed maximum depreciation of property prices by four per cent between the third and fourth quarters of 2014. 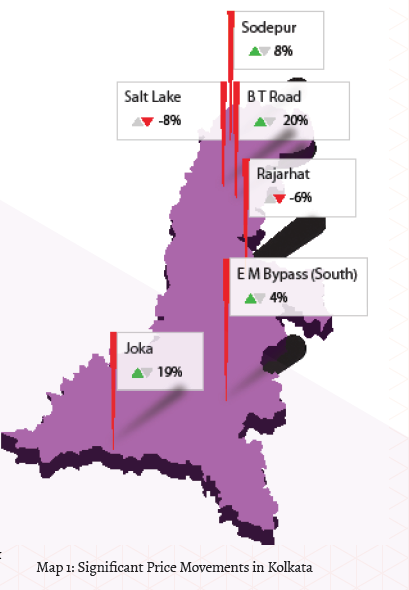 The promise of excellent city-wide connectivity offered by the proposed expansion of the Kolkata metro network and improvement of IT infrastructure in Rajarhat and Salt Lake led to an uptrend of two per cent when compared year-on-year. Howrah had recorded a massive uptrend of 23 per cent last year. The locality took its growth trajectory to a new height when it clocked 43 per cent in the quarter ending December as compared to the previous. In addition to the metro project which, when completed, will connect Salt Lake in the east with Howrah in the west, capital value of properties surged in anticipation of planned growth after the State Secretariat of West Bengal relocated to Nabana. For almost three decades, the area has been afflicted by lack of basic civic amenities, such as poor water supply and faulty drainage; however, newfound government attention led to increase in the number of project launches last quarter. B T Road saw substantial growth of 20 per cent, both, last year and between Jul-Sep 2014 and Oct-Dec 2014. Prices increased due to the revival of the ambitious Bonhooghly project. Situated on a 17.2 acres site and comprising 17 towers and 34 buildings, the project is expected to boost North Kolkata’s real estate story. 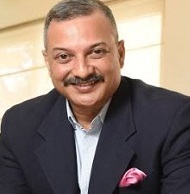 In addition, a joint venture between the Jain Group headed by Mr. Prem Jain and owners of Noapara land intend to develop a premium residential project on lines of the Victoria Memorial, called Dream Victoria, which is another reason for spike in average prices. The resumption of the Bonhooghly project has boosted prices in Belgharia as well. Capital values in the northern suburb commanded an increase of 17 per cent in Oct-Dec 2014 as compared to the preceding quarter. The locality had grown by 23 per cent last year. Consistent growth in this area which primarily houses G+4 buildings can be credited to the fully functioning Belghoria Expressway. Capital values in Joka jumped by 19 per cent in Oct-Dec 2014 after sliding down by four per cent last year. Slow progress of the Joka-BBD Bagh metro project and subsequent stalling of work due to a land dispute caused land prices to decline. However, the locality underwent some basic price correction and the metro project received a breather in the form of approval for construction of a viaduct. This cleared hurdles for the elevated section of the metro project. A year-on-year analysis revealed that prices of properties in Salt Lake upped by a decent margin of nine per cent last year. However, the locality recorded a downtrend of eight per cent in Oct-Dec 2014. The positive sentiment in Salt Lake had been nurtured by excellent infrastructure, presence of IT companies in Sectors III and V and the promise of metro connectivity. However, the East-West metro project which was to connect the locality with Howrah Maidan is stuck in a deadlock, leading to the decline in capital values. The posh locality of Tollygunge in South Kolkata witnessed a spike of 18 per cent in the quarter ending December. The upward trend has continued from last year when capital values advanced by 25 per cent. Properties in the locality always sees high demand due to its good infrastructure, connectivity to business districts and affordability. Furthermore, prices of Tollygunge range between Rs 4,000 per sq ft and Rs 5,350 per sq ft, as opposed to the neighbouring locality of Jadavpur whose property prices start from Rs. 5,300 per sq ft. In the last quarter, the locality saw the launch of a residential project featuring sustainable lifestyle model, the first-of-its-kind in Kolkata. Capital values in the saturated property market of Jadavpur fell by 19 per cent in the Oct-Dec quarter as compared to the previous. Even on a year-on-year basis, prices dipped by 11 per cent. Crowded and chaotic streets, frequent traffic congestion at the main road intersection, narrow roads, lack of green spaces have contributed to the steady decline in the value of properties despite the presence of the renowned university. 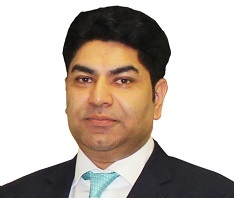 Proximity to the Eastern Metropolitan (EM) Bypass has resulted in a 15 per cent surge of property prices in Prince Anwar Shah Road Connector, year-on-year. Within one quarter - from Jul-Sep 2014 to Oct-Dec 2014 - real estate prices upped by 17 per cent owing to the Kolkata Municipal Corporation’s initiative to repair roads. The southern stretch of the EM Bypass saw a rise of 12 per cent last year. 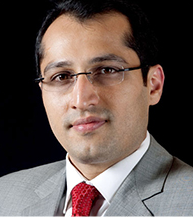 Witnessing a similar uptrend in the Oct-Dec quarter, the stretch recorded a surge of four per cent. The connectivity offered by the bypass spanning Ultadanga in the north to Kamalgazi in the south is a major reason for the buoyant realty market. Capital values in Jessore Road plunged by 43 per cent between the third and fourth quarters of 2014. Last year, property prices of this area had fallen by 27 per cent. Despite the fact that NH-34 starts from this area, the deplorable condition of this arterial road makes it an accident-prone zone. The state government had commissioned an initiative to widen the road; however, the endeavour was stalled as a result of encroachment. Property prices in Kamalgazi have been constantly dropping – 18 per cent last year and 24 per cent in Oct-Dec 2014. The locality has been facing infrastructural challenges. Furthermore, the proposed flyover, which would connect Baruipur Road and Kamalgazi on the EM Bypass and help lessen traffic snarls, is not yet complete. Narendrapur’s realty saw a decline of 20 per cent from Jul-Sep 2014 to Oct-Dec 2014 due to its arsenic contaminated ground water. Capital values in this locality fell by 14 per cent last year. Capital values in Sodepur had dropped by five per cent last year; however, it surged by eight per cent in the Oct-Dec quarter. Property prices in this otherwise congested locality have been propelled by the recent road infrastructure improvement and reasonable real estate prices. 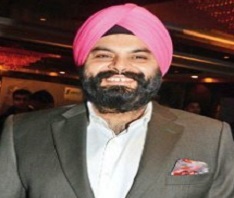 Furthermore, the locality has been receiving attention from big players such as Godrej Properties and Siddha Group. Kolkata’s financial hub, Rajarhat, saw property prices dipping by two per cent last year and six per cent in Oct-Dec 2014 despite governmental initiatives to attract investors and make the locality more industry-friendly. The state government’s refusal to grant special economic zones (SEZ) to corporate houses has adversely impacted the latter’s decision to open offices in Rajarhat. Recently, Infosys surrendered its land and moved to Bhubaneswar. Rental values in Kolkata dropped by seven per cent from Jul-Sep 2014 to the quarter ending December. Values in East Kolkata plummeted by nine per cent and the south saw a downtrend by six per cent. Rajarhat in East Kolkata commanded a maximum spike of five per cent owing to the presence of global IT firms. The workforce that these corporate houses attract typically prefer rented apartments. The rental market of Tollygunge remained stagnant while that of Jadavpur, Uniworld City, New Town and the entire stretch of E M Bypass saw an average dip of 14 per cent in Oct-Dec 2014. The downtrend is mostly the result of weak infrastructure and lack of government initiatives to propel industries. Supply of residential apartments has seen a very slight growth of one per cent, while independent houses/ villas have dipped by the same margin in Oct-Dec 2014 as compared to the preceding quarter. 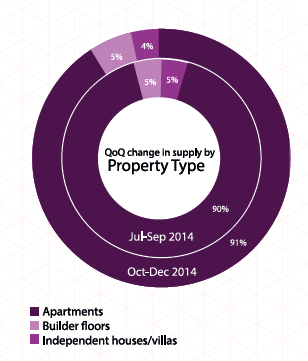 Availability of builder floors has remained constant quarter-on-quarter. Apartment buyers of Kolkata are spoilt for choice with this property type making up nine-tenth (91 percent) of the total market in the quarter ending December. Builder floors saw the second highest supply with a mere five per cent share of the total inventory, while availability of independent houses/villas was the least during the same span. As expected, the city had an abundance of properties in the middle income segment ranging between Rs 25-40 lakh. The category bagged more than a quarter of the real estate landscape despite dipping marginally by a per cent from the Jul-Sep 2014 quarter. Those looking to invest in properties worth Rs 25 lakh or below also found a substantial array since the affordable segment was the second highest supplied (22 per cent). The affordable bracket was followed by high income housing (Rs 40-60 lakh) which captured approximately one-fifth of the market. Availability of properties in this brackets remained unchanged quarter-on-quarter. Kolkata’s elite can boast of exclusivity as properties worth Rs 1 crore and above make up only a tenth of the total on a decline. However, the luxury housing segment (Rs 60 lakh – Rs 1 crore) witnessed a decent supply of 18 per cent in the current quarter. The city had witnessed a spurt of new projects in the wake of the metro network expansion and improvement of road infrastructure. 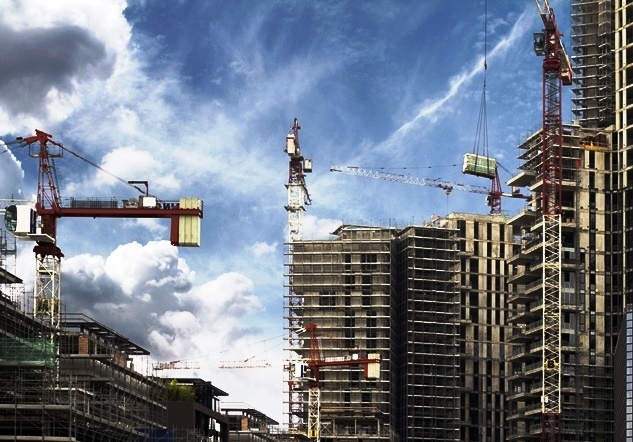 However, since all developmental work has either been halted or is moving at a snail’s pace, most real estate projects continue to carry the status of being under construction. Therefore, close to half of the total inventory available for sale in the city was under-construction, with the rest being ready to move in. Almost half of the high income housing segment (Rs 40-60 lakh) and nearly two-third of the houses in the mid income (Rs 24-40 lakh) and affordable brackets (within Rs 25 lakh) came in the under construction category in the quarter ending December. The three segments, together, saw an average rise of five per cent in the number of properties in the under construction category during the same period. The increasing number of ready to move in properties in price range of Rs 25-60 was offset by the luxury and ultra-luxury segments which recorded two-third of the properties in the ready to move in category. 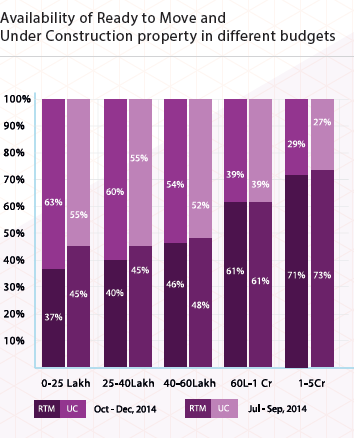 Mid income houses made up almost one third of the total properties under construction in the Oct-Dec 2014 quarter, while the affordable segment constituted 27 per cent of the market. 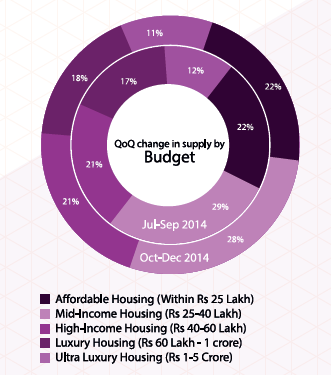 On comparing room configurations available in the Oct-Dec 2014 quarter with the Jul-Sep quarter, supply of ready to move in houses has declined by a considerable margin in the 1BHK and 4BHK categories. While the 1BHK units recorded a decline of 14 per cent in supply of ready to move in properties, 4BHK units witnessed a dip of nine per cent. 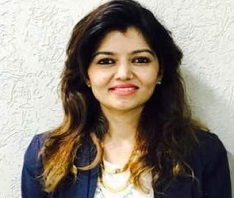 The mid-sized homes configured as 2BHK units saw the maximum supply in September ending quarter, while 3BHK houses took the lead in fourth quarter of 2014 by capturing 45 per cent of the market. Properties with 1BHK configuration took up the least share in both the Jul-Sep and Oct-Dec quarters and the availability of 4BHK units remained unchanged when compared quarter-on-quarter. While more than half the 2BHK and 3BHK units were under construction in the December ending quarter, nearly two quarters of 4BHK properties were in the ready to move in category. The 1BHK houses saw equal distribution in ready to move in and under construction categories during the span. Very few web-sites that transpire to become in depth below, from our point of view are undoubtedly properly worth checking out. How to convert your home into a bed and breakfast unit?